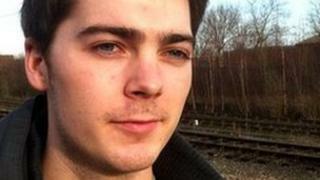 Home Secretary Theresa May has approved the extradition to the US of a student accused of copyright infringement. The US authorities say 23-year-old Sheffield student Richard O'Dwyer's TVShack website hosted links to pirated films and television programmes. A spokesman said Mrs May had "carefully considered all relevant matters" before signing the order. Mr O'Dwyer's mother Julia, from Chesterfield, said he had been "sold down the river" by the government. Mr O'Dwyer has argued that TVShack did not store copyright material itself and merely directed users to other sites, making it similar to Google. He could face a maximum sentence of five years in the US. Speaking to BBC Newsbeat, Mr O'Dwyer said: "I've done nothing wrong under UK law, and, it's pretty ridiculous isn't it? "A 65-year-old man was extradited a few weeks ago, so if they can extradite someone that old they can extradite anyone really, couldn't they? "Copyright laws differ between countries and that's yet to be fought, that argument." On Tuesday his mother said: "Today, yet another British citizen is being sold down the river by the British Government. This decision does not mean for a moment that Richard O'Dwyer is going to be put on a plane, now, today, tomorrow or the next week or so. There will be a full hearing. He is being extradited under the 2003 Extradition Act, this is the controversial act under which Christopher Tappin, the 65-year-old British businessman was also recently extradited. Gary McKinnon the alleged computer hacker, his extradition is also being sought under that act, and it is an act which many people say is a lopsided relationship which favours the United States. If we want someone from there we have to show what they call 'probable cause', we have to present evidence. If they want someone from here they have to show 'reasonable suspicion'. It's worth also mentioning that the offences that they want Richard O'Dwyer for are copyright infringement offences which carry five-year prison sentences each in the United States - in the UK it's a much lesser prison sentence of two years each. "Richard's life - his studies, work opportunities, financial security - is being disrupted, for who knows how long, because the UK Government has not introduced the much-needed changes to the extradition law. "The US is coming for the young [Richard], the old [Chris Tappin] and the ill [Gary McKinnon] and our government is paving the way. "By rights, it should make for an interesting conversation between the Obamas and Camerons aboard Air Force One - but I'm not holding my breath. "If Richard appears to have committed a crime in this country - then try him in this country. "Instead, the home secretary wants to send him thousands of miles away and leave him languishing, just like Chris Tappin, in a US jail, before he has a chance to demonstrate his innocence, under British law, of the allegations made against him." She added: "It's disgusting. Next time it may be your son. I urge everyone who cares about unfair extradition to write to their MP and insist this disreputable law is changed. "We are now carefully considering all Richard's legal options." The Home Office has clarified the time Mr O'Dwyer has to appeal against the home secretary's decision. It said an individual had 14 days from the time of notification. In Mr O'Dwyer's case, that was on Monday, so the deadline for him to appeal is 26 March.